Use CaptureLeave free for 60-days and see what other absence management systems lack. Get plenty of time to kick the tires and see if we are right for you. 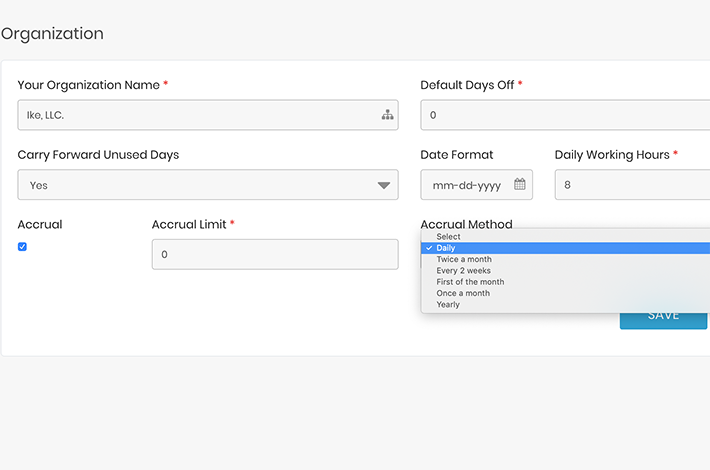 From automatic leave calculation, to accruals, CaptureLeave will save you time and money. You already have much on your plate. Let us manage all your absence and leave requirements. This leave and absence management system is comprehensive. 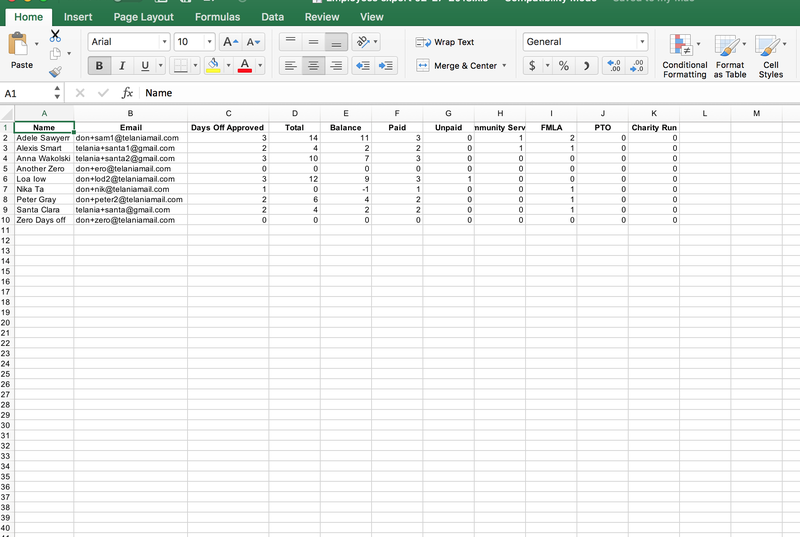 Easily add employees, managers, and messages. 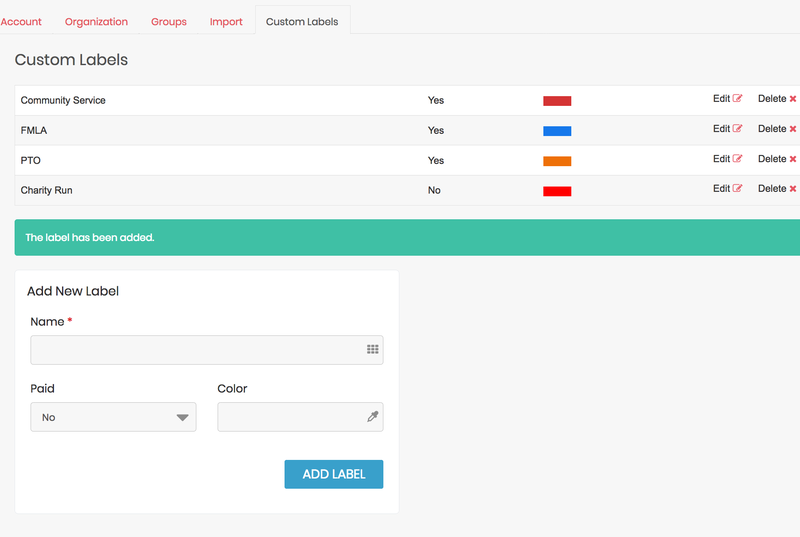 Create groups, labels, and documents. Nothing to install, no setup, always on leave, absence management. 24/7 support. CaptureLeave provides real solutions minus the IT headaches. Create, share documents including company policies. Upload documents in any format, set up access rules to ensure HR Compliance. 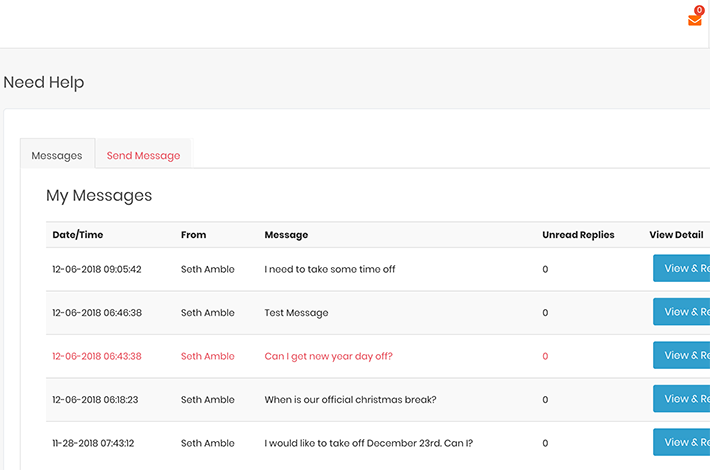 CaptureLeave also features a Messaging System for fast communication. Get the best mobile experience managing all your leave and absence requests from any mobile device. It works on any device anywhere anytime. Anyone in the administration department or the HRD knows how hard it is to approve, reject, and keep files of everyone on leave. Employees are frustrated with the archaic process of filling out a form, submitting it to HR, and waiting for their request to travel from one department to another until it gets approved. Skip the headache by using our leave management system. 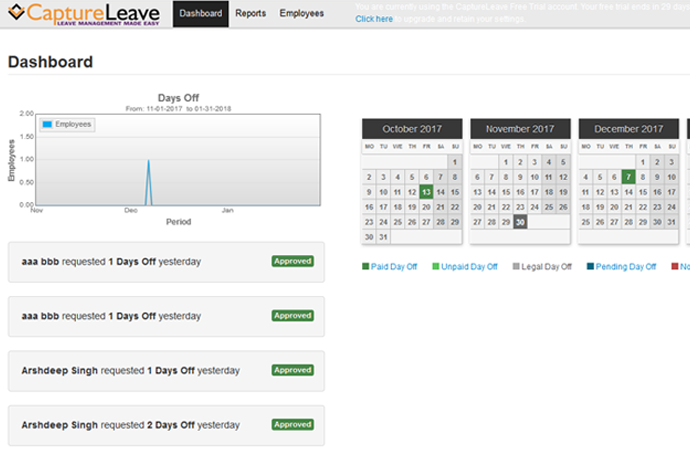 CaptureLeave provides an extensive employee leave of absence, vacation tracking scheme with an employee vacation calendar that can easily handle all your leave management concerns. 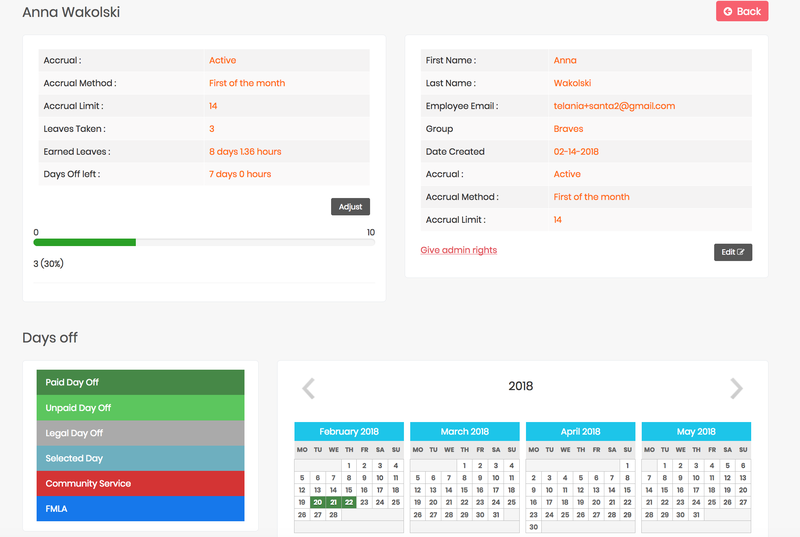 Simply create an account today, add all the possible holidays in a year, create groups and upload HR documents depending on departments at your office. Once everything is set, employees can easily file their leave requests online and you can easily approve, reject, and even place notes on the leave requests. The leave management software is the most efficient solution to not only tracking down vacation leaves of every employee, but it also makes vacation leave filing and approvals paperless! You can forget about filing approved or rejected requests or pinning them to a calendar, since all these information are available for checking and updating anytime online. CaptureLeave believes in creating an absences management and vacation tracking software that is not only efficient and comprehensive, but also easy to use and easy to learn. 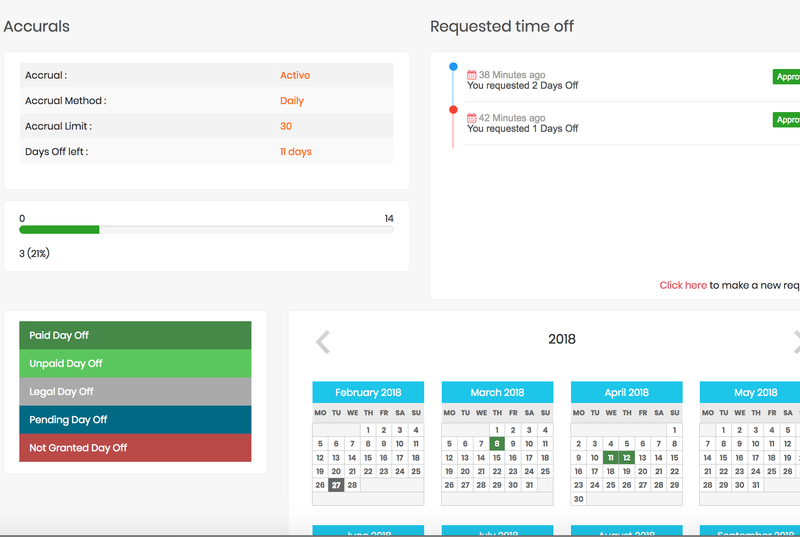 With this leave management software you can easily view the calendar and see which employees are already on a scheduled leave, approve or reject requests, send out email blasts, create reports, and post all the holidays for the year. The leave management software is available for use 24/7 so you can access it anytime, anywhere. 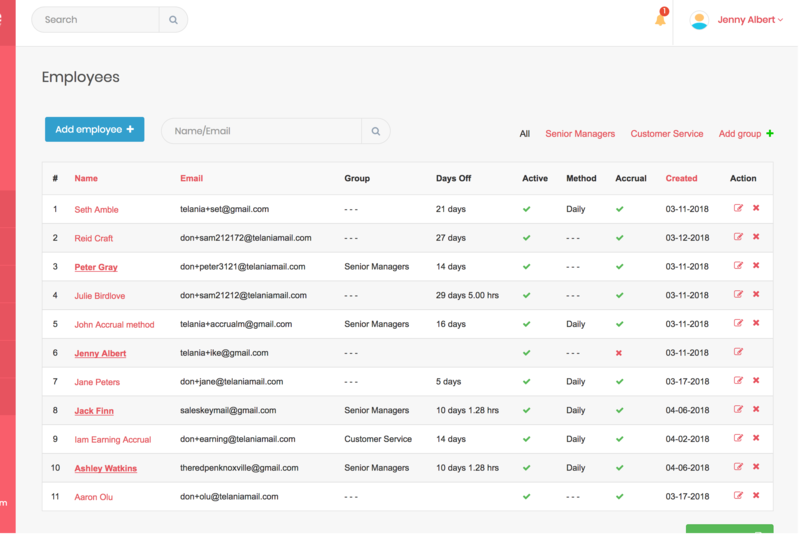 Forget about complicated hardware and hard to use leave, absence management and PTO softwares, CaptureLeave not only provides an easy to use online leave management system, you get full, free support anytime. What use is an absence management and vacation tracking software if it can’t be flexible to all your company’s terms? 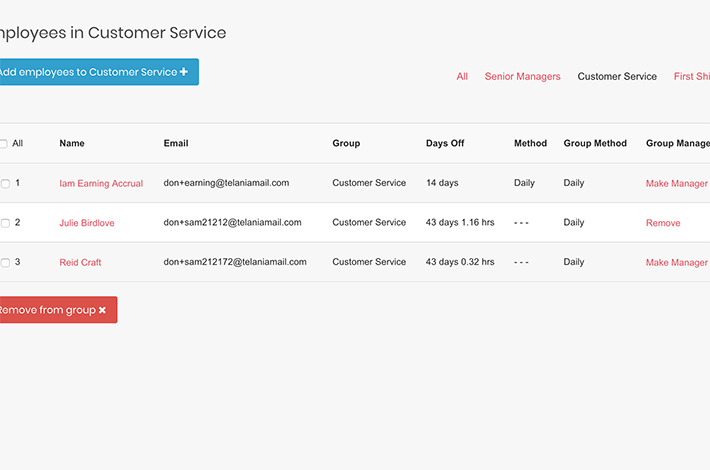 CaptureLeave allows you to use and customize web tools depending on how your company handles employee leaves. 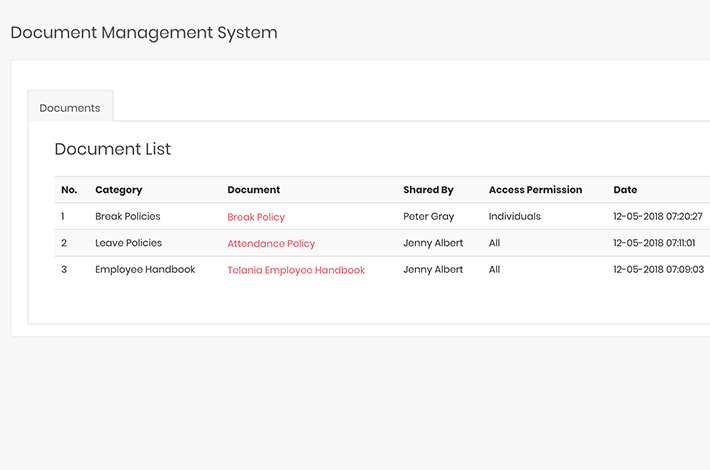 This feature will empower your HR department, allowing them to handle and process all leave applications with ease. No more tedious and boring paperwork. No more manual work. Just an easy cloud-based absence management solution. CaptureLeave is all about making your life easier. For tracking vacations, leaves of absences, documents, CaptureLeave is the solution. Take it for a test drive and see for yourself. For a limited time we are making CaptureLeave absolutely free for 30 days. Create your free account today and start saving time and money on leave management and vacation tracking. CaptureLeave is comprehensive. 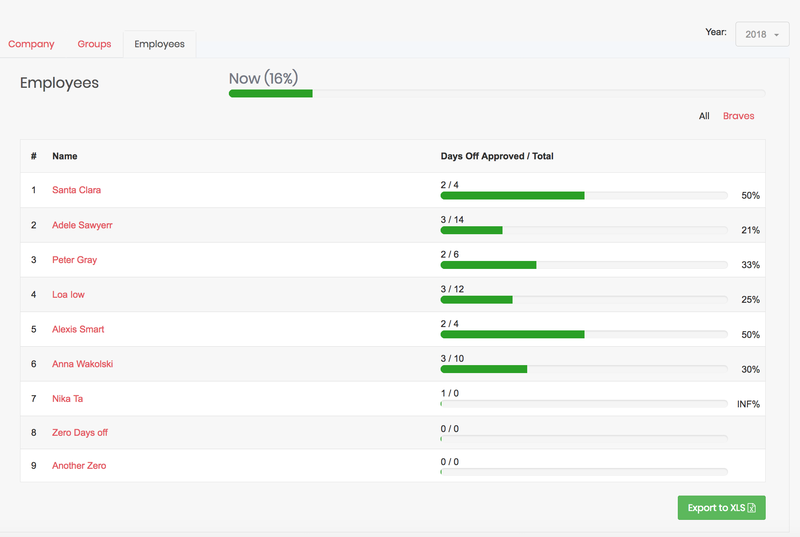 Easily add employees, create groups add annual holidays list, filter, approve, reject, communicate, and document. View live demonstration. High grade encryption protects your data. Securely access your account from any internet connection anywhere anytime - 24/7. Your data is automatically backed up. * We provide you a deep, persistent service. Simplified low pricing with no long term contracts so that you are in the driver’s seat. 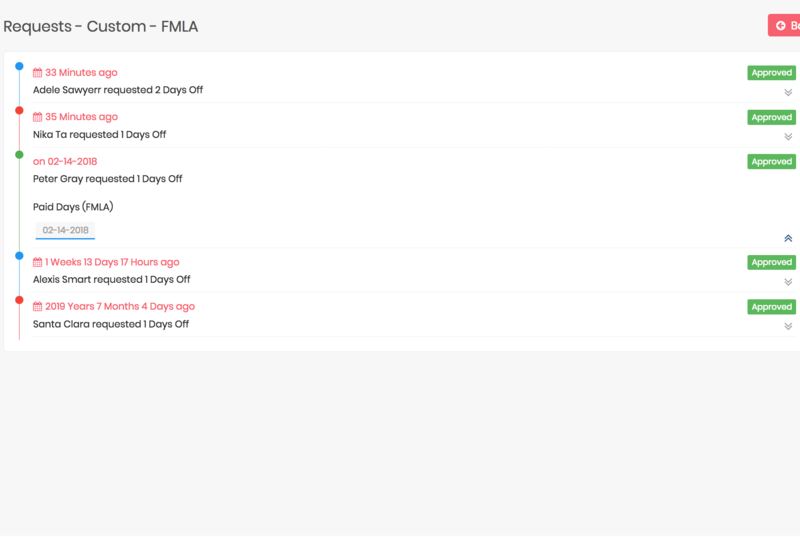 Increase efficiency and documentation using CaptureLeave to manage all vacation tracking and leave requests. Reduce absenteeism! 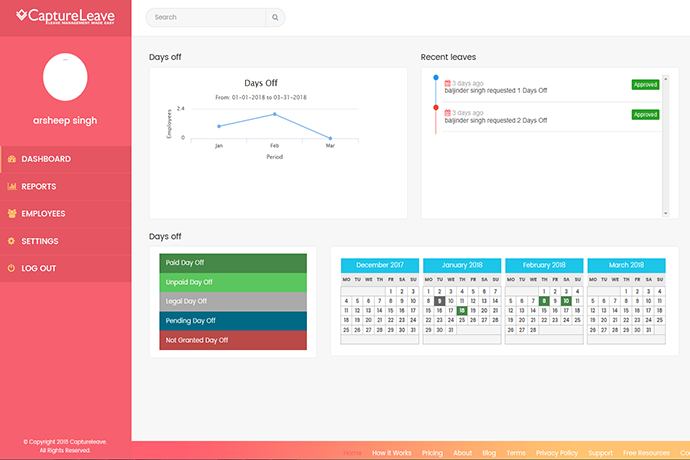 This intuitively easy to use and flexible system is design to empower HR departments to quickly handle leave management and vacation tracking online 24/7. Instantly react to business changes while accessing superior support free of charge. 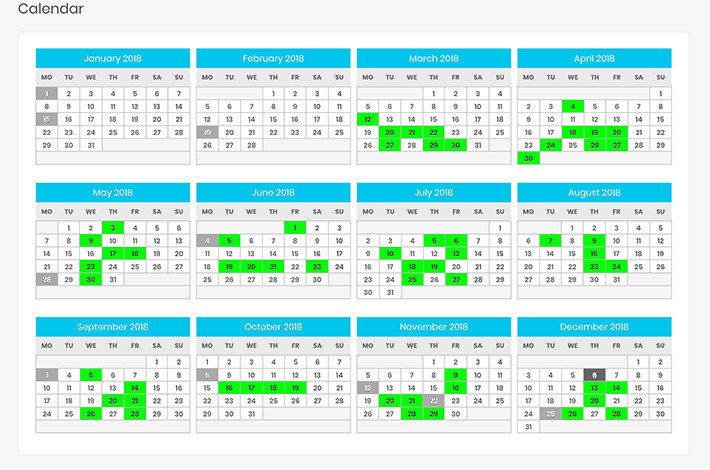 Quick calendar view, color coded requests, reports download, Annual Holiday lists, email alert system, and much more. Get 99.99% uptime guarantee because server downtime impacts your bottom line. Anyone in the administration department or the HRD knows how hard it is to approve, reject, and keep files of everyone on leave. Employees too know how hard it is to fill up a form, submit it to HR, and wait for their request to travel from one department to another until it gets approved. Why go through this grueling process when you can simply use our leave management system! For businesses handling a hundred employees or more, tracking vacation leaves of each one can be confusing especially when manually administered, resulting to costly errors. CaptureLeave offers the best solution to dilemmas like these. We are an online leave management system that can easily record, track, and document all employee vacation leaves with just one click! CaptureLeave provides an extensive employee vacation tracking scheme with an employee vacation calendar that can easily handle all your leave management concerns. Simply create an account today, add all the possible holidays in a year, and create groups depending on departments at your office. After everything is set, employees can easily file their leave requests online and you can easily approve, reject, and even place notes on the leave requests. The leave management software is the most efficient solution to not only tracking down vacation leaves of every employee, but it also makes vacation leave filing and approvals paper less! You can forget about filing approved or rejected requests or pinning them to a calendar, since all these information are available for checking and updating anytime online. CaptureLeave believes in creating a vacation tracking software that is not only efficient and comprehensive, but also easy to use and easy to learn. 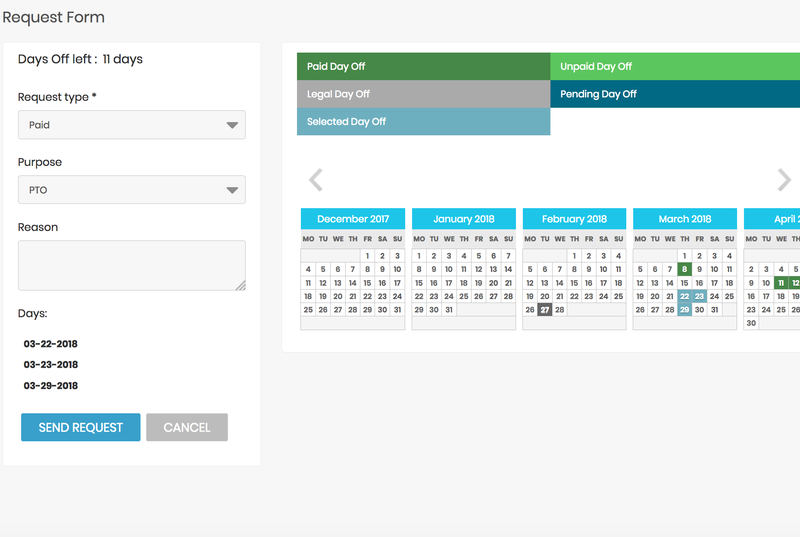 With this leave management software you can easily view the calendar and see which employees are already on a scheduled leave, approve or reject requests, send out email blasts, create reports, and post all the holidays for the year. The leave management software is available for use 24/7 so you can access it anytime, anywhere. 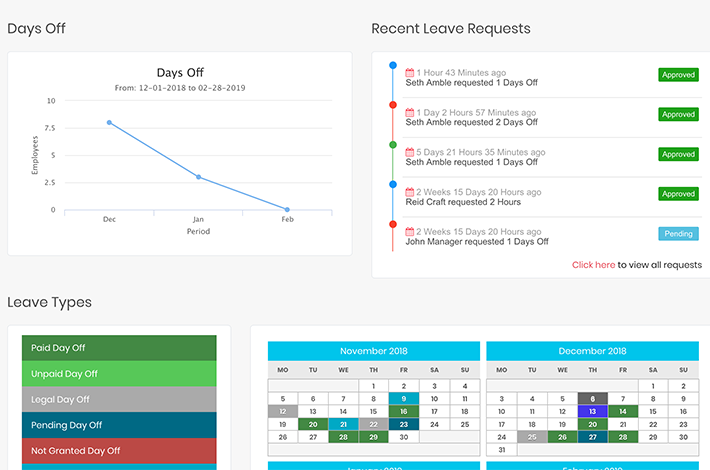 Forget about complicated hardware and hard to use leave management and PTO softwares, CaptureLeave not only provides an easy to use online leave management system, you can even experience all of this for free! What use is a vacation tracking software if it can’t be flexible to all your company’s terms? CaptureLeave allows you to use and customized web tools depending on how your company handles employee leaves. 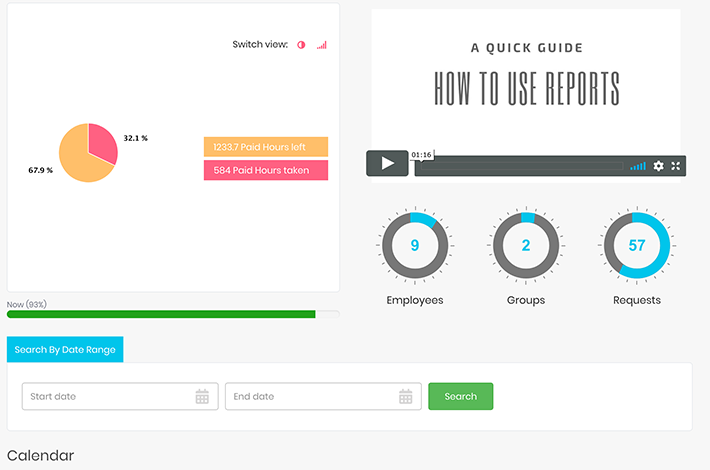 This feature helps empower your HR department and allows them to handle and process all leave application with ease. No paper, less manual work and an easy online registration. CaptureLeave is all about making your life easier. 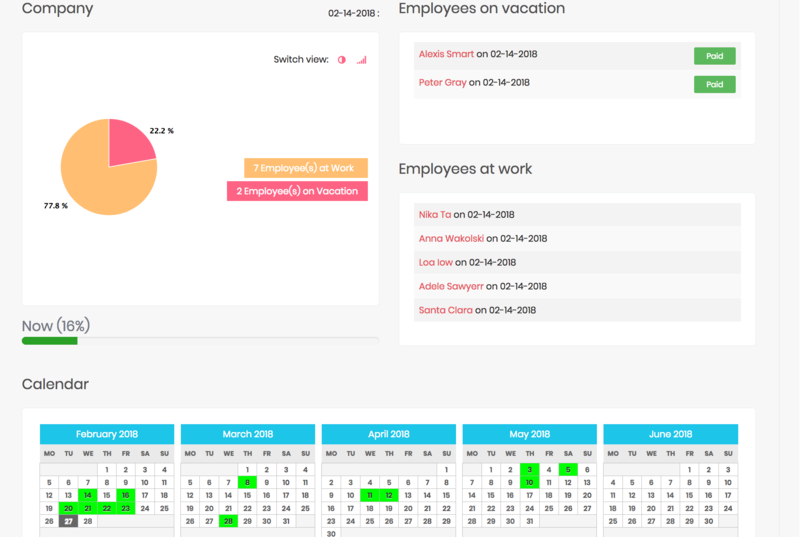 For tracking vacations and leaves of absences, CaptureLeave is the solution. Take it for a test drive and see for your self.